This report provides an overview of the seats contested by component parties in PH and the winning odds for each seat. Detailed election forecast results are not available at the moment due to the cost involved in running simulations, however the winning odds will give a rough idea of the swing in support that PH needs to win control of the state. Analysis was performed based on the 2017 1st Quarter (Q1) electoral roll, State and Federal seat results from the 13th General Election (GE13) and individual historical voting patterns from GE12 (2008) and GE13 (2013). This report provides an overview of the seats contested by component parties in PH, the winning odds and forecasted results for each seat under a number of different scenarios. Analysis was performed based on the 2017 1st Quarter (Q1) electoral roll, 2016 3rd Quarter (Q3) electoral roll, State and Federal seat results from the 13th General Election (GE13) and individual historical voting patterns from GE12 (2008) and GE13 (2013). This report provides an overview of the impact of state constituency redelineation on the Selangor State elections. 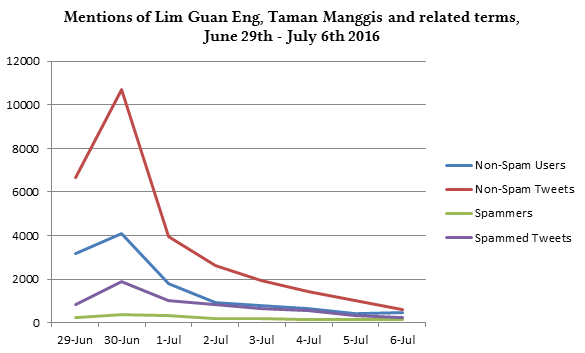 Analysis was performed based on the 2016 1st Quarter (Q1) electoral roll (before and after redelineation), State and Federal seat results from the 13th General Election (GE13) and individual historical voting patterns from GE12 (2008) and GE13 (2013). Gender breakdown figures do not add up to the total. This may be due to Facebook users not sharing their gender, and also due to rounding errors by Facebook when dealing with specific age groups. State breakdown figures also do not add up to the total, due to the same rounding errors. 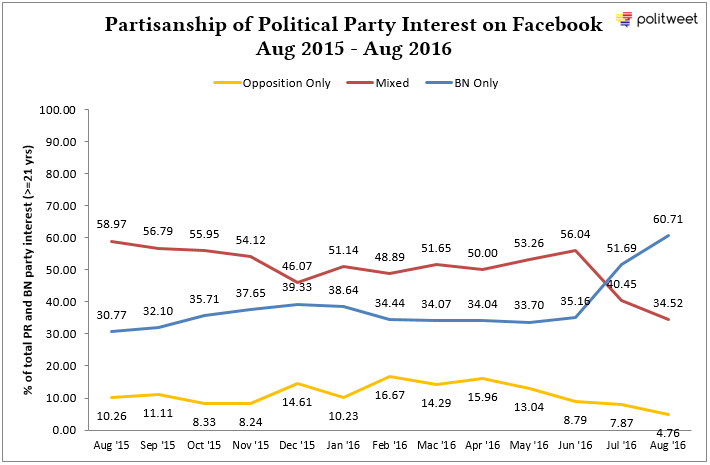 The following graph shows the partisanship of interest in political parties by Facebook users in Malaysia aged 21 years and above. 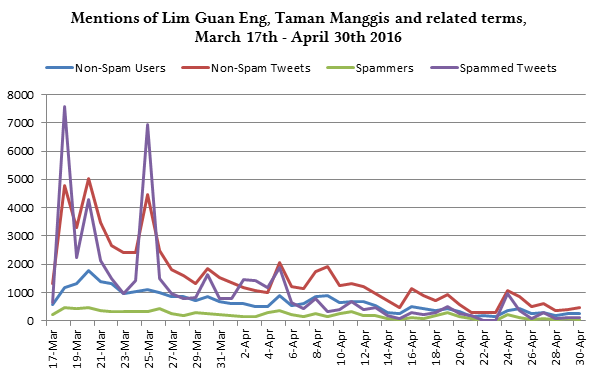 Interest in PAS is assumed to include interest in AMANAH because Facebook has not made separate AMANAH figures available yet. As of August 2016 the level of exclusive interest in 60.71% for BN and 4.76% for the Opposition. This is a record high for BN and a record low for the Opposition since we began tracking these statistics in December 2012.